Kittens, this is not how one does Stashdown. I am not the best role model…this quarter, anyway. 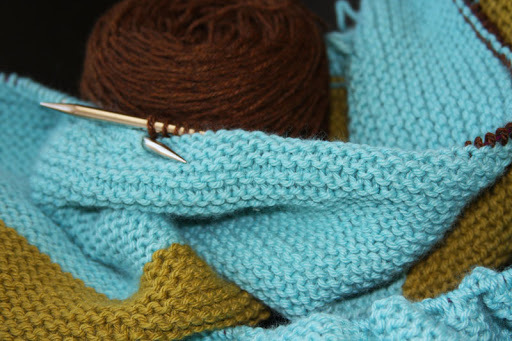 Blanket quantities in + almost no finished objects = in the red. Despite this, I’m feeling pretty positive in terms of Q2, where I have no plans to do extra yarn buying and I’m determined to finish something larger then a pair of socks or some small toys. 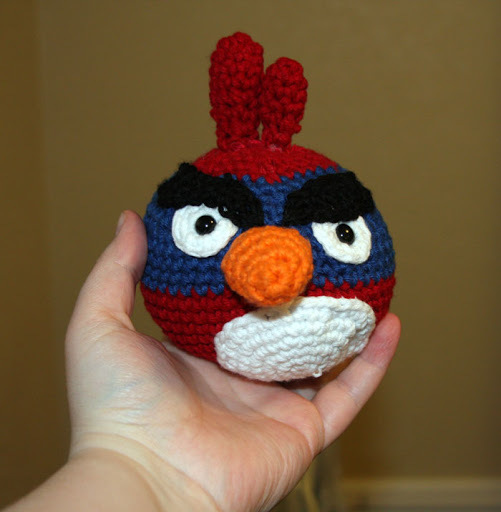 With my knitting/crocheting mojo picking back up, this should be able to happen. By the end of 2011, I should be in the green for the year. And really, I better be. We’ll be moving around that time and I really do not want to keep track of multiple containers of yarn. For those of you out there who are also working on stash maintenance and reduction, how are you doing? Better then I am, I hope. It’s that time again, kittens…. Another month has come and gone and I managed to knit more then 1,000yds this month; my average is still intact! So that’s pretty cool. I’m also sad that 600yds of this year’s work will be ripped out, but I’m not worried about that with my tallies. When I’m tracking with the Snob Group that sort of thing counts, but not in my own little kangaroo court. And really, isn’t that the one that matters? I’m hoping April will be a bit better and maybe with some FOs to show for it. Oh, kittens. Before I get down to my knitting update and what is annoying me, I’ll start with my quilting which is behaving just fine. 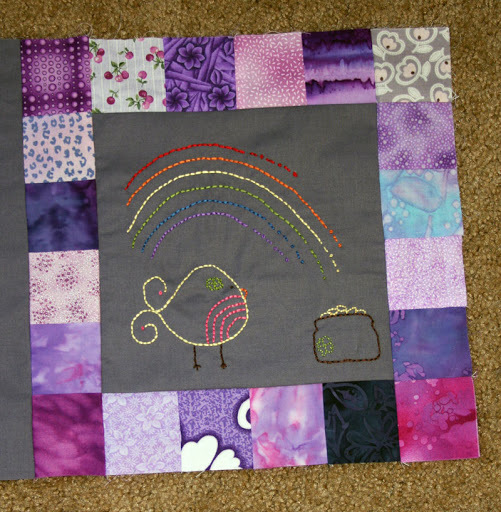 First is my Birdie Stitches block for this month. I ended up altering the embroidery to jazz it up a bit. It didn’t really scream, “March!” as it had been. This is the first time I’ve changed anything, and I’m hoping I’ll like April as-is. This is also the first time I’ve taken so long to get my block done for the month. The reason for this is two-fold. One, I decided to stop giving myself eye strain and ordered some white transfer paper which took a while to arrive. Two, with The Mister gone the first 2/3 of the month, I didn’t feel much like embroidering. Sharp needles and frayed nerves due to crazy children just do not mix well. But hey it’s done. And I even have the first three months sewn together. 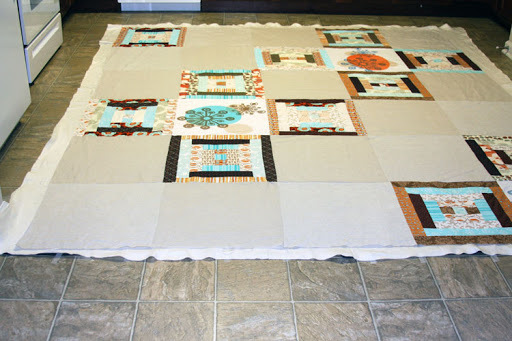 I’m keeping up with piecing-as-I-go! 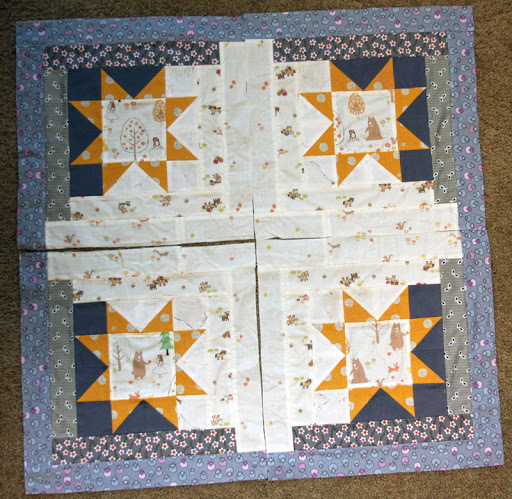 My Star-y Log Cabin quilt. I didn’t work on it much this month, but it’s coming along nicely. I didn’t cut any points off of my sawtooth stars. I’m super proud of myself for that! I’m still debating what size this will be, since a few of my seams are very thin and I’m unsure this can take the wear and tear of being a normal blanket. I’m not sold on the idea of it as a wall hanging though, either. I’ve never been big on decorative quilts in my own home. I’ll figure it out at some point, I’m sure. And now onto my knitting. Last week without the sleeves, my sweater was looking pretty good. But I started to feel nervous when trying it on. It kept nagging at me and that nervousness turned to agitation. Is it obvious here yet? As you can see from that little bit of my mouth, I’m not pleased. Can you see how the shoulder seams are outside of where my shoulders are? That it wants to hang off because it’s wide in the neck? Maybe you notice that I’m wearing a long sleeve shirt under this and it’s still doing that…. 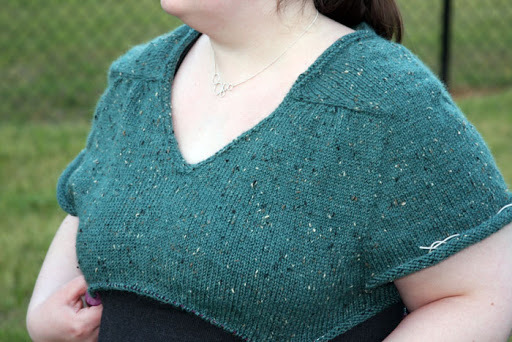 I started cursing up a blue streak when I was editing these photos and realized just how much too big this sweater is. Here, I had been thinking it was just a bit too big in between the shoulders in the back, and now I realize it’s too big everywhere but maybe not the bicep and across the chest. This is what I get for going up a size from what I usually knit. 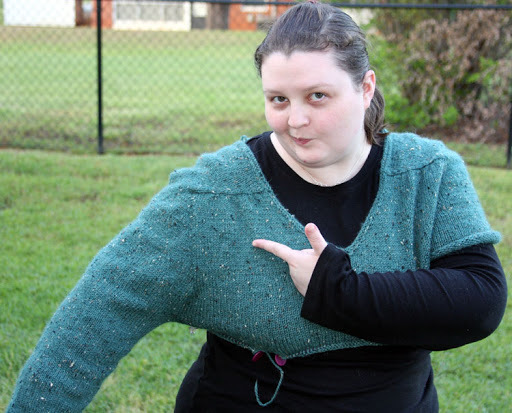 Even though I have a 45.5″ bust, I usually knit a 38″-40″ size. Those measurements work best for my torso and I edit the bust and arms from there. This one is a 43″. I wasn’t familiar with the construction and didn’t want to mess around too much this time around. I did mess with the arm depth measurement. As written, it was supposed to be just shy of 9″, and I stopped at about 8.5″. As you can see, I should have stopped much sooner. Probably at about 8″. My arm pit is NOT down by the bottom of my breast. Had I gone the full 9″, it would have hit my waist, high though it may be. I often get frustrated with how patterns are scaled. The assumption is that as one gets wider, all of the measurements should be scaled up proportionately, even vertical ones. To make a pattern my size, it’s often assumed that I’m at least 4″ taller then I am. It would be even more if I went by my actual bust measurement–those often assume I’m pushing the 6′ mark. (Let’s not even go into the bust measurement that most often corresponds with my bicep measurement.) Someone on Ravelry had commented that she had worked in the industry–retail clothing, not patterns–and that for sizing they scaled it up so the different sizes nest like Matroyshka dolls. Rather then call in a second, larger model to base the plus sized pieces off of, they continued to scale up. It’s not uncommon for me to try on pants and the crotch is about to my knees. Pattern scaling seems to work much this same way. Just make the arm hole .25″ to .5″ deeper for each size up you go! Height makes the arm bigger because it’s adding stitches to the count….right? WRONG. Wrong, wrong, wrong. Anywho, this problem is common enough that Ysolda’s new book has extensive sizing information in it. I remember participating in a survey she did asking for bust size, bicep width, and a measurement to determine the vertical depth of your armpit. She wanted to figure out what kind of alteration information would be most helpful and not surprisingly, there are a lot of large chested, big armed women out there who do not need 9″ deep armholes and are not 6′ tall. GO FIGURE. While this is exciting, it’s little consolation for my current sweater which will need to be frogged all the way back to the saddles. Those are just fine; everything else is too big. Please feel free to chime in and tell me to get it over with. Kittens! Knitting! Sweater! Working at a decent pace! How many exclamation points are needed to show just how excited I am about this? 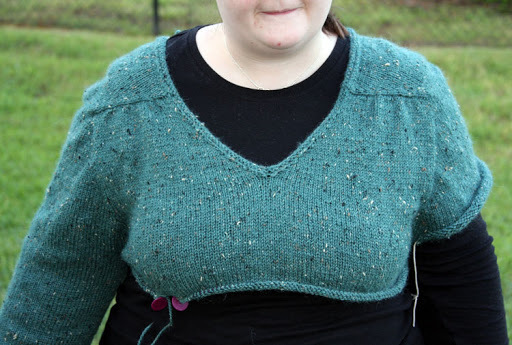 In the past week, I’ve managed to knit double the yardage I already finished on this sweater. It’s coming along quickly now that I’m able to try it on and confirm that it’s OK. Knitters who swatch and then knit without ever trying something on confuse me a lot. I don’t know if I’ll ever “get” that mentality. Maybe I take for granted the fact that my body requires so many different pattern sizes to make something fit that I have to try all of my sweaters on and make sure they’re working. I can never just Trust The Swatch. The pattern has since been released for sale, and I would recommend it. 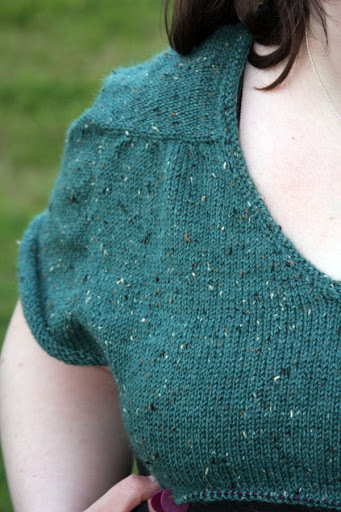 The construction is not difficult at all and the saddle shoulder construction is a nice change from raglan sweaters. It’s still seamless with no fussy sewing in of sleeves. Hopefully, I’ll have a more in-depth FO post for this soon as well as a review for the yarn. I have…interesting things to say about it. 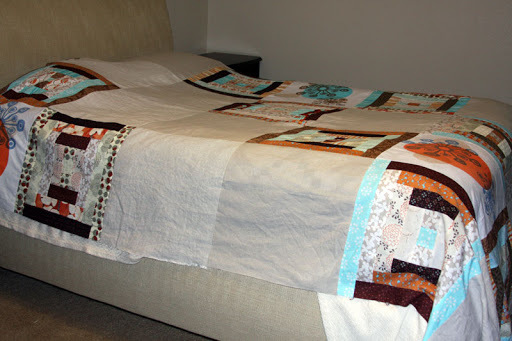 This is how I spent last night: sandwiching our bed quilt. It took about twice as long as I thought it would, and I had forgotten how hard on the body it is to work with such a large piece. My knees and back where really unhappy with me last night by the time this was finished. And this is how I’ll be spending today and tonight. Honestly, quite a few more, “today and tonights,” will be spent like this. I’m quilting these lines close together, about 3 per inch. It’s a pretty neat textural effect so far. Slow going and hard-earned progress on this knitting WIP. 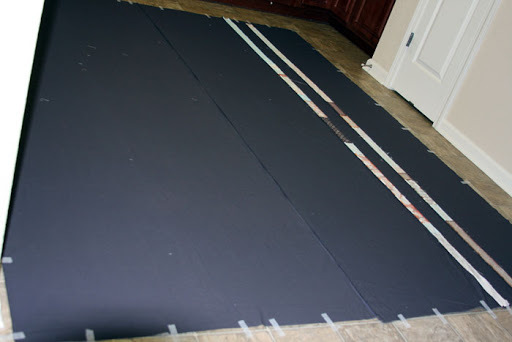 When I originally calculated the size, I believe I said this is ~95″ across. It’s a lot of knitting per row, kittens. A lot of knitting. So far I’ve used 1 skein of the bright green, 2 of the bright blue, and now I’m starting a section that is 7 skeins of the chocolate brown. Once that is complete, I’ve finished the bottom of the blanket, and I can unravel the provisional cast-on and work my way up the top. I’ll be about 1/3 of the way done at that point. I should finish by the end of the year. 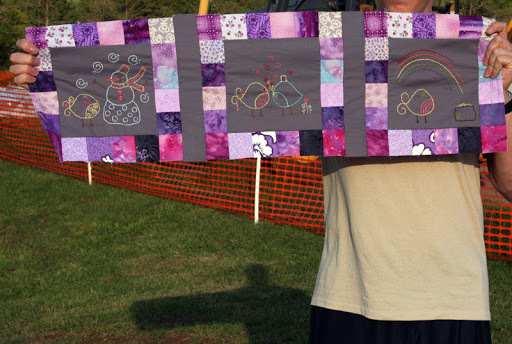 I should have some more quilting/sewing posts coming up soon as well. Kittens, we have gone almost 1/3 of the way through March, and I haven’t blogged once. Not once. I suppose I could explain myself but eh, that’s not all that much fun to read about, is it? You do not come here to read about what’s going on and why I haven’t been doing anything; you come here to read about what I have been working on. Who is that amazing masked bird? Angry Birds love has hit this house and hard. Even though he’s not allowed to play it on our phones, The Boy is obsessed with the game and has taken to setting up his own scenarios to play out. I decided that maybe it was time to make him some plush characters to toss around instead. Now that I’ve finished these two, he’s been bombarding me with requests for every other bird. The designer of this pattern has already made patterns for the others, minus one bird. 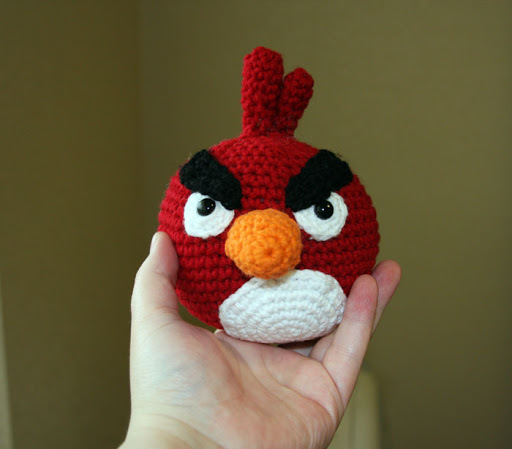 The cardinal happens to be a free Ravelry download. I’m the world’s slowest crocheter, and I still managed to pop both of these out in under 2 days. And if anyone is wondering, no, there are not any masked birds in the game. I ran out of Cherry cotton-ease and had to find a way to make it stretch to get a second bird done. The Boy thinks it’s pretty cool and is convinced it’s from the actual game, so who am I to argue with him? It feels really good to finish up a yarn-y project; I’m hoping to maybe focus on getting some others off of needles in the near-ish future as well. I’ve been making slow but sure progress on my bed quilt. Minor things keep going wrong and slowing me down. When this happens, I stop and work on something else for awhile instead. I’m hoping to get moving on this again tonight and at the least, fix a mistake that has kept me from sandwiching this. What about you, kittens? 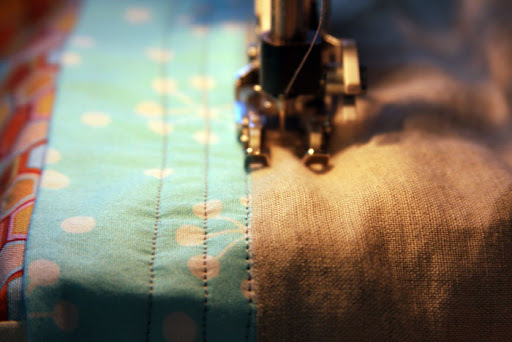 Are you working on much or has February/March been slow crafting time for you as well? Maybe your energies are focused elsewhere instead?